Custom Farmers Almanac Personalized in Bulk. Promotional, Inexpensive. Best price in the USA and Canada. Bulk customized farmers almanac with 96 pages. 4 million readers, timeless appeal, weather forecasts, fishing calendar, gardening, entertaining short stories, cooking recipes and timely household tips. 1 color black imprint on outside front and outside back cover. One of America's oldest and most treasured publications of all time. 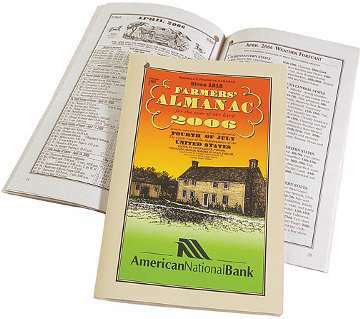 The Farmers' Almanac was founded in 1818 and today has become a part of everyday life, culture and tradition. Free artwork design. High quality, lowest prices in USA and Canada for wholesale customized Farmers Almanac. American clients pay no taxes. Prices include your 1-color custom imprint on both the front and back cover. Production Time: 11 days after art approval. Size: 5-1/4 H" x 8 W", 96 pages full of very useful info.